1. Obey and respect the driver. 4. Keep your hands, feet, and body to yourself. Grandes, u otros artículos no escolares. Remember that the district has a consistent late start every Monday, so when looking at your stop times, please add 75 minutes to them on Mondays. For those families that are new to Lake Chelan School District, thank you for being part of our district! Once again, Welcome Back to all students and families. Welcome back for the 18-19 school year and we hope you had a wonderful summer vacation. Following are the route schedules to start school with times and stops available for you to see when the bus will be there to pick up and drop off your child. These times are estimates, so please be at the bus stop 5 minutes early to catch the bus. If the routes have major changes after school starts, we will send letters home to parents explaining the changes. If your exact address is not on the bus list, then your stop will be at the nearest point to your house. As always, you can call the transportation department to ask questions at 509-682-2442. To comply with OSPI boundary requirements. Most MOE students who live within these boundaries can safely walk to school in 5 to 10 minutes time. 6 Trout / Anderson Rd. / Willmorth / Isenhart / Union Valley / Riverview Cemetery Rd. 15 McNeil Canyon / HWY 97 N of Beebe Bridge / Howard Flats / Apple Acres Rd South of Howard Flats Rd. In order to assure safe transportation to and from school, responsible student behavior is extremely important on the school buses. Students who choose to misbehave may endanger their safety, the safety of other students, and the driver. 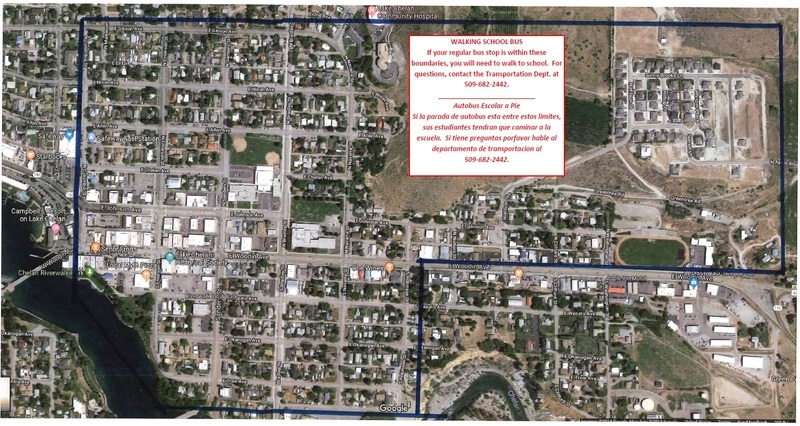 Inappropriate and disruptive behavior may result in disciplinary action by the Lake Chelan School District. Students are expected to comply with the following rules and regulations specified by the Washington State Superintendent of Public Instruction, WAC 392-144 &145 and Lake Chelan School District. Students are expected to follow the instructions of the driver the first time they are given. Students being transported are under the authority of the driver, including the assignment of seats. Fighting, wrestling, or boisterous activity is prohibited on the bus. Threats of physical harm to other students or the driver are prohibited. Students are required to be at the bus stop ready to board the bus five (5) minutes prior to the scheduled time. Students shall not bring animals, insects, tobacco products, matches, lighters, firearms, glass objects, skateboards (unless in a specifically designed fully padded and enclosed skateboard bag), scooters, roller blades, weapons, balloon bouquets, or any other potentially hazardous material on the bus. Musical instruments will be approved on a case by case basis. When necessary to cross the road to board or depart the bus, students shall cross in front of the bus at the instruction of the driver. Students may only open windows with permission of the driver and not lower than two clicks on the window frame. No portion of the student’s body shall be extended through the bus window. Students shall have written permission from the parent/guardian and the signed approval of a school authority in the form of a bus pass to depart the bus at a bus stop other than their assigned stop. Students shall remain seated at all times and may only sit facing forward with their back to the seat. Students shall converse in normal tones; loud, profane or vulgar language is prohibited. Students shall keep the bus clean and refrain from damaging it. Eating or drinking on the bus is prohibited. As always, please feel free to call us at the bus garage if you have any questions or concerns at 509-682-2442.